The Cornell Soil Health Team will be providing its second annual Cornell Soil Health Train-the-Trainer Intensive Workshop this summer from August 16-19. This international workshop focuses on measuring soil health and improving soils through holistic soil management. The target audience is professionals working with agricultural and nonagricultural (including urban) soil management issues. The Cornell Soil Health Program has developed cost-effective methods for soil health assessment, targeting important soil processes such as aeration, drainage, root growth, disease pressure, nutrient release, etc. Specific management recommendations are also suggested to address soil health constraints. This intensive soil health workshop will include a mix of classroom training, hands-on laboratory experience, field assessment of soil health, generating the soil health report and its interpretation, and a field trip to local farms to discuss adopted soil health practices. Registration and program information are available on our website. Sign up now, while there is still space – the program is limited to 35 participants! need plants that can tough it out where you live. 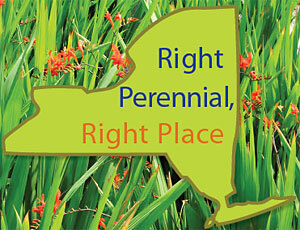 Martin Viette Nursery, (East Norwich, NY), Mark Adams Greenhouses (Poughkeepsie, NY), Baker’s Acres (Groton, NY), and Grossmans (Penfield, NY). Additional support for the project came from the New York Farm Viability Institute, New York State Flower Industries Inc. and the New York State IPM Program. Cornell is bigger than a bunch of buildings sitting on a hill. Cornell is thousands of people, each with their own story. Let’s start piecing together that mosaic and show the world who we are. Make a sign telling how Cornell is in your life, how the university has touched your world, how you relate to the Big Red. Then, have someone snap your photo holding it. The only rules are that your sign must have your name (first only) and the phrase “I Am Cornell” on it. If you are or were a student, it would be great if you included your class year too. Be creative. Have fun. 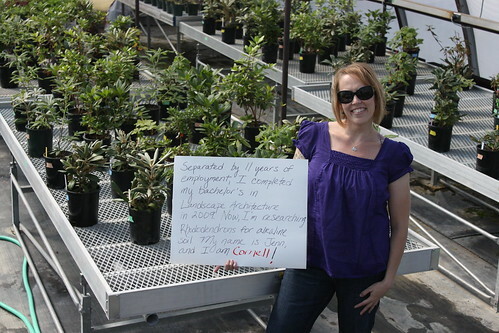 Share your Cornell with the world. 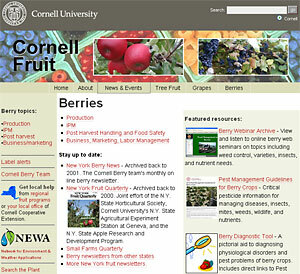 New berry portal of the Cornell Fruit website. The berry portal of the Cornell Fruit website and the online Berry Diagnostic Tool have been redesigned, revamped and relaunched. Improvements in the berry portal include a redesigned homepage, easier access to featured resources, an updated 2010 berry label alert page, and direct links to berry-related articles from the NY Fruit Quarterly. The Berry Diagnostic Tool, was originally designed in 2001 by Dr. Marvin Pritts as an online compliment to NRAES’ berry production guides. Users click through a series of questions to diagnose common berry problems. The 2010 version, extensively revised and expanded by Dr. Pritts and Extension Berry Specialist Cathy Heidenreich, now provides more on biotic and abiotic diseases, insects and mites, and wildlife damage. Developing Integrated Pest Management protocols for Northeast organic apple production. Find project summaries at the NESARE website. There’s an old expression that ‘great wine is made in the vineyard,’ and it’s true. It is important to Cornell and the breeding program to partner with our New York industry. Getting them off to a good start is the most important way that homeowners can protect [new] trees. Water it, protect it from construction, choose the right tree for your area. There has to be a match between the tree and the site, which is why knowing the site conditions is important.